Grapefruit is fill with vitamin C, B and other wonderful antioxidants. This subtropical fruit is hybrid of sweet orange and pomelo. Grapefruit also has Calcium, magnesium, folic acid, iron, potassium and phosphorus for our daily need. Grapefruit is a perfect and super food for increasing your body’s metabolism. A dietary fiber in grapefruit pectin is good for digestive track health and digestion. Naringenin in grapefruit helps to repair damaged DNA in prostate cancer cells. 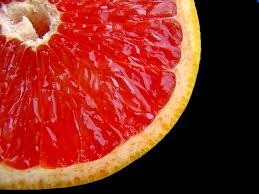 But patients of high blood pressure, heart, allergies, depression and even HIV should consult or inform their medical adviser before using grapefruit. Other health and beauty benefits are here for your health and beauty knowledge. To control heavy bleeding during periods (menses) grapefruit juice is very much effective to this problem. To reduce excessive thirst blend green coriander leaves in 250 grams of grapefruit juice and drink it. Increase appetite by improving stomach health. Continues use of grapefruit juice for 3 weeks not only removes out gallbladder stone but also improves its health. Rubbing its peel off on your skin improves complexion and removes dark spots, freckles and spots. Best treatment for vomiting and sinus. Just sprinkle salt and sugar on 250 grams grapefruit slices and eat it. Combination of water and grapefruit juice one of the easy way to lose weight naturally. Application of grapefruit pulp on forehead is helpful to treat headache. Add 1 tablespoon green coriander leaves juice in 1 glass of grapefruit juice and drink it. Grapefruit peel off help to drain out and kills stomach and intestinal worms. Smelling grapefruit flower power to your brain.